This is the most rugged looking subcompact SUV we’ve ever laid eyes on and chances are it'll make it to America. 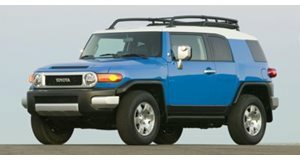 Don’t let the stout lines and rugged dimensions of the Toyota TJ Cruiser fool you, this box-shaped SUV is no larger than a Toyota RAV4. And for us, that’s a good thing because it could mean it’ll come to America soon after it goes into production. But how do we know Toyota will actually put its latest 2017 Tokyo Motor Show reveal—which has a name that sounds suspiciously close to "FJ Cruiser," leading us to believe its successor was coming back when it was first patented—into production? The answer is that nobody knows for sure, but Toyota did leave a few telltale clues that allude to production aspirations. One of these is the fact that the TJ Cruiser is designed to fit onto existing Toyota platforms. During an interview with Motor Trend, a member of the TJ Cruiser’s design team, Hirokazu Ikuma, said that the concept was built to be able to ride on Toyota’s TNGA (Toyota New Global Architecture) platform. Ikuma even claimed that Toyota asked his team “to come up with a design that was very real so that if the company wants to build it, we can put it into production very quickly.” It’s why the TJ Cruiser features things like real B-pillars, practically-sized wheels, and proportions that can translate easily to a road car. With so much planning already done, it leaves one to wonder why Toyota hasn’t already pulled the trigger and put the TJ into production. The answer is that the company still needs to figure out how marketable the vehicle is in the first place. “We still need to know how marketable and usable the TJ is,” said Toyota product planner and TJ Cruiser development team member Mai Takeuchi. “We have no type of car for young, active people. They love the Land Cruiser. They just can’t afford it.” When he says they have no type of car for the young and active, Takeuchi is talking about the fact that Toyota no longer sells the RAV4 in Japan. If the TJ Cruiser is received well enough at the Tokyo show, it'll first be built for the Japanese market. If and when that happens, there's a solid chance the TJ Cruiser migrates to the US as well, though we don't expect Americans to take too well to those sliding rear doors as they invoke memories of being bullied at school for their parent's automotive choices. And like a minivan, the TJ Cruiser may very well be powered like one. A small displacement engine is expected to power either the front wheels or all four of them. Meanwhile there's also a hybrid option on the table. Engineers even ensured to design the concept to accommodate a hybrid drivetrain in case the order to put the TJ Cruiser into production comes through immediately. If it doesn't have the rugged capabilities that young Land Cruiser aspirers desire, at least it'll look like it does.